© Tom Brenner/The New York Times Secretary of State Mike Pompeo this month at the State Department in Washington. Secretary of State Mike Pompeo will outline a new strategy on Monday for constraining Iran, centered around a demand that the United States’ European allies have already rejected: that Tehran enter negotiations in a new deal that would permanently ban Iran from any substantive manufacturing of nuclear fuel and, in turn, forever cut off a pathway to building a bomb. Mr. Pompeo is expected to call for broadening the number of countries engaging in the talks, perhaps hoping to pick up help from other nations, like Japan and Arab states, that were not involved in negotiating the 2015 deal with Iran that President Trump pulled out of about 10 days ago. But the negotiating strategy of the United States’ new chief diplomat is unlikely to be embraced by major European powers, who opposed Mr. Trump’s move and are talking now about how to nullify the effects of threatened United States sanctions on European firms that do business with Iran. But Mr. Pompeo has calculated that for all of Europe’s bluster, Mr. Trump’s sanctions threat — which would ban any company that does substantial business in Iran from doing business with the United States — will ultimately work. Total, the French oil giant, announced this week it is canceling planned contracts in Iran, and the top executives of other multinational companies have said, some publicly and others privately, that they have no choice. Iran is a relatively small customer, and the United States is its largest. 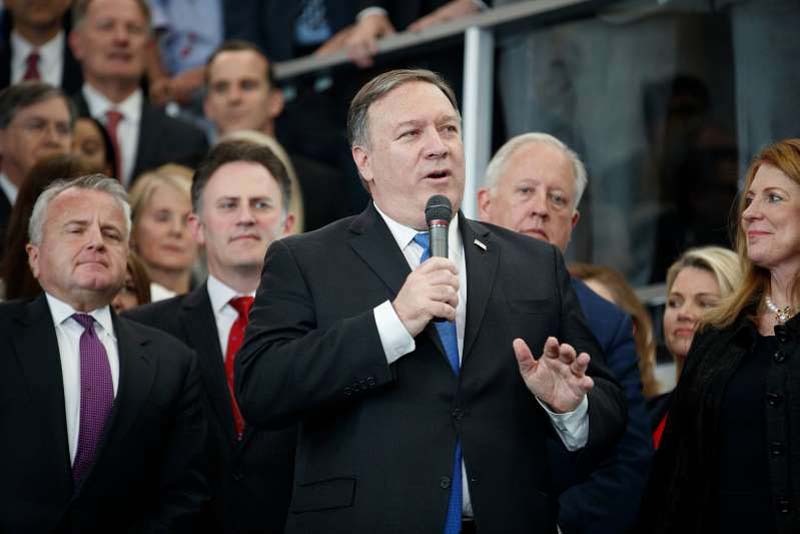 Mr. Pompeo’s plan calls for a new negotiation that will embrace stronger and longer nuclear limitations, restrictions on missile tests and exports, and limits on Iranian activity to support terrorist groups or the government in Syria. Officials say they are also trying to figure out how to enforce limits — or sanctions — on Tehran’s cyberactivity, fearing that the Iranian response to the United States will come not in the nuclear arena, but in attacks on banks and financial institutions. The last major Iranian cyberattacks on American systems came in 2012 and 2013. They retaliated against cyberstrikes by the United States and Israel on Iran’s nuclear facilities, and also responded to escalating sanctions. Internet security firms say they are already seeing an escalation in Iranian probes. Mr. Pompeo’s speech on Monday, to be delivered at the Heritage Foundation, is expected to play down the divisions with Europe. “I think it’s more than fair to say that we agree with the Europeans on much, much more than we disagree on,” said Brian H. Hook, the director of policy planning at the State Department, who conducted the unsuccessful negotiation with Britain, France and Germany to agree on major amendments to the nuclear accord that was in place before Mr. Trump’s exit. The major sticking point with the Europeans was language that would have extended — indefinitely — limits on Iran’s ability to produce enough enriched uranium or plutonium to produce a bomb in under 12 months. While the Europeans said they had no objection to that goal, they could not achieve that without reopening the terms of the 2015 deal with Iran. The Trump administration wanted to impose the requirement unilaterally, with the threat that sanctions would be automatically reimposed if the Iranians got closer to a weapon than the 12-month standard. Now the sanctions have been reimposed anyway, and European leaders find themselves caught between competing impulses to resist Mr. Trump’s mandates and to work with him. Mr. Hook argued that with the old deal cast aside, there is a chance for new diplomacy — though he offered no guess as to whether the Iranians would engage. So far, Iranian officials have indicated they are planning to abide by the requirements of the 2015 deal. But there is clearly a debate underway in Iran — argued by some members of the Islamic Revolutionary Guard Corps and people who were deeply invested in the nuclear program — that the United States never intended to allow Tehran to rejoin the Western economies. They have advised Iran’s leaders to simply bar international inspectors and resume uranium enrichment. “There are now only two countries that matter for Iran,” Vali Nasr, a Middle East expert and the dean of the Johns Hopkins School of Advanced International Studies in Washington. “They are Russia and China, and they haven’t showed their hand” on whether they would join Iran in seeking to frustrate Mr. Trump’s effort to isolate the country. Russia has been Iran’s partner in the war in Syria. China, meanwhile, may see an opportunity to strike energy deals with the Iran despite the American sanctions, betting that the United States could not afford to cut off Chinese suppliers. “But they will discover that regime change is not an exact science,” he said. Mr. Pompeo is unlikely to talk about leadership change in Iran during his speech on Monday, officials said. But he will discuss a broad containment policy. During the Obama administration, officials gave similar speeches before striking the 2015 deal. But those were different in nature because the major European states were fully participating in sanctions, determining they were the best way to force Iran to negotiate. Mr. Trump’s decision to scrap the results of that negotiation, however, may have so angered European officials that they will simply refuse to negotiate a new deal — unless they fear the economic consequences will be overwhelming.